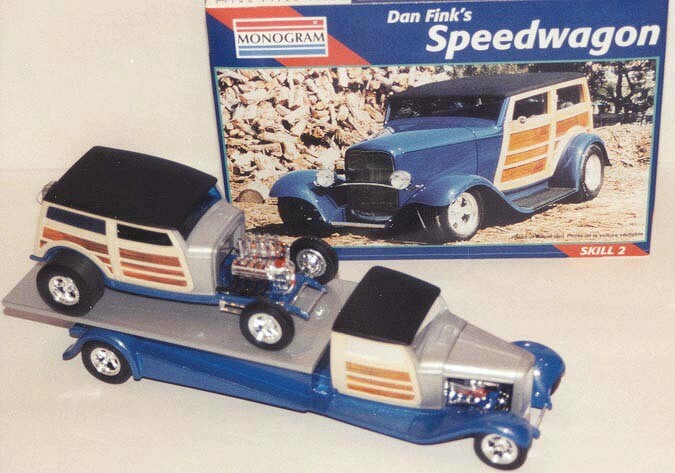 When I first saw the Speedwagon kit, I saw a ton of possibilities and bought 4 kits at once. At the time I built this pair I was into building race cars and haulers but this hauler was an afterthought. 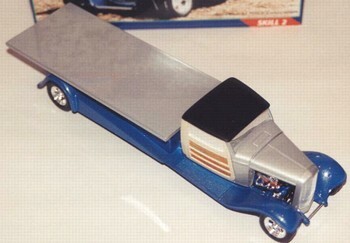 I always loved the old wedge bed race car haulers from the sixties and seventies, but a wedge bed was just out of the question for the small cab on the truck so I went with a flat bed. The frame was stretched using plastic I-beam stock and the bed was built with sheet styrene and incorporates the stock fenders. 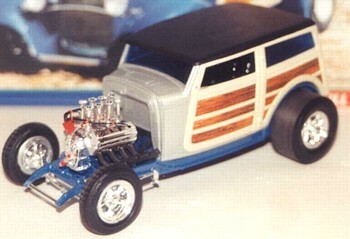 The power plant from the kit was used as well as the running gear which was modified with a three-piece drive shaft to accommodate the frame stretch. The cab was radically altered and no interior was installed because I put sun reflecting mirrored glass in. I got ahead of myself taking this photo as you'll notice by the missing headlights on the truck. The race car is pretty straight forward out of the box. Done as a fenderless AA/Fuel altered with an injected Desoto hemi and blue tinted glass for that oldies look. Both vehicle's frames are painted Boyd's True Blue Pearl and the termite proof part of the bodies are painted Testors Metallic silver with a light misting of Model Master Clear Pearl over everything and then a top coat of Testors High Gloss Clear. The wood sections were painted with Walmart 88 cents a can Light Tan enamel. The tops of both vehicles are painted flat black to simulate early attempts at vinyl tops. As always everything comes from a heated aerobics oriented container. This Quartermile Duo would fit right in at any of today's Newstalgia events.